Distributions work together with streams to indicate the number of copies that should be sent to each branch. Distributions identify the branches that should receive copies of a serial. Streams identify how many copies should be sent to each branch. Streams are intended for copies that are received on a recurring, even if irregular, basis. Click the hyperlinked title of the distribution. The number of streams that have already been created for this distribution displays adjacent to the title. You can choose one of two ways to create a stream: New Stream or Create Many Streams. The New Stream button allows you to create one new stream and assign it a routing label. 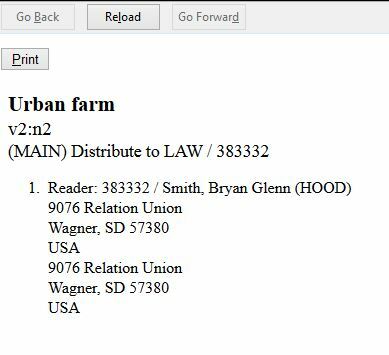 Enter a routing label so that the copy could be read by specific users or departments before the copy is shelved. The routing label appears during receiving and could be added to routing lists; it is not viewable by the public. Routing lists do not print from in 2.0. This field is optional. The "Create Many Streams button" allows you to create multiple streams at once, but it does not allow you to add a routing label when you create the stream. Enter the number of streams that you want to create in the How many. Field. Within Alternate Serial Control View, you have the option to create routing lists for selected streams. Routing lists enable you to designate specific users and/or departments that serial items need to be routed to upon receiving. These routing lists can now display user addresses when you receive the items. This feature is particularly useful for working with homebound patrons. When you receive the item in Serials Batch Receive or from within Alternate Serial Control’s Batch Item Receive, the routing list will print the user’s address. For more information, see the chapter on Batch Receiving. The default template can be configured to not include the user’s mailing or billing address on the routing list. Libraries already using customized templates will not be affected.